In 2014-2015 starts the celebration for the Centenary of the First World War. There are a lot of events and project not only in Italy, but in the whole world for increasing the tourism in the places and teach the history to the people. In Italy one of the most important places for this events are located in the North-East. 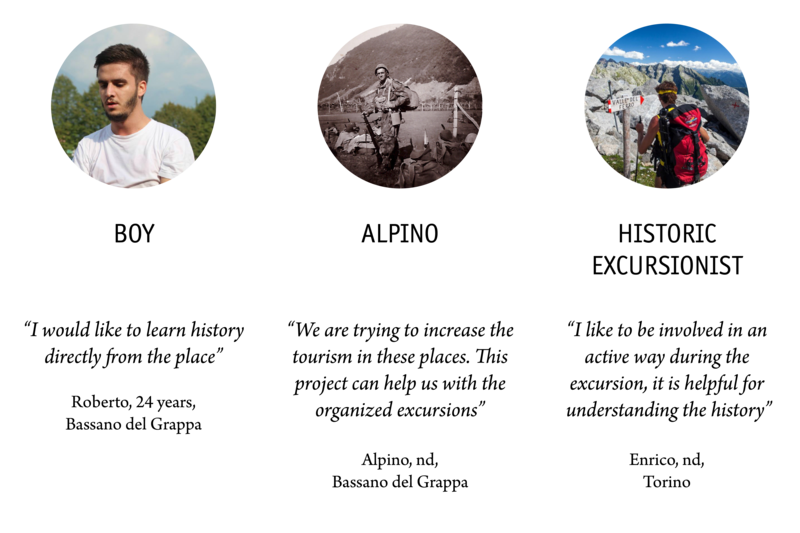 I choose for this project the Monte Grappa where it is possible to find path, trance, galleries and material related to the war. The most of people in Italy doesn’t know these places and their importance. I want to realize an engaging project for helping people exploring the place and learning the history. In this area there is a big will to increase the tourism and make this places important Open Air Museum that attract people. I spoke with different personalities and each has a different need but every of them want to explore the place and increase the visit of these places. Through the research I learnt the set of opportunities given by the Centenary commemoration that involves different areas in Italy, especially in the North-East. I choose as the place of interest the Monte Grappa and I considered the need to increase the number of visits, both with educational purpose and for exploration, not only through the contents, but also through the place. The problem lights up how the fruition methodologies and the absord of contents can affect on the educational level, because an active partecipation from the user can increase the quantity and quality of the information received and stored along the path. 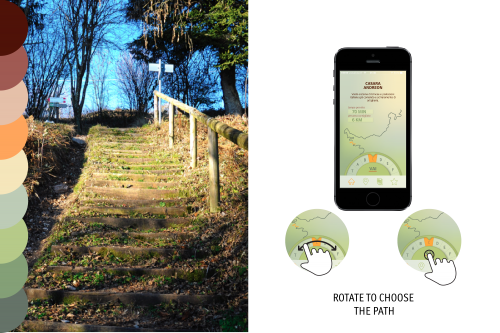 Thanks to the actual presence of path and signals and to their regeneration, I discover a possible field of action and I decided to realize a smartphone application that interacts directly with the place. I also decided to support the app with a paper map that helps the user to orientate, minimalizing the use of the telephone, it could be disturbing during a mountain excursion. The app is a vehicle between the user and the place and shows the contents found on the path that are sent to the smartphone through a specific sensor, the beacon, with a Bluetooth Low Energy technology. Finally I analized in a specific way the interaction of the app and the function of each screen. The color palette is the result of an in-depth study, because the cromatic choice has an essential importance for giving the correct atmosphere between the place visited and the treated themes. In conclusion I want to light up how this project can be easily realized with a low budget; it also offers a unique and innovative experience that can astonish and involve the user. I realized an App with a simple interface for helping people during the excursion. The color are natural and taken from the place for a best integration with the nature and the content. I decided to use few and simple gesture to give more space to the contents and to the exploration of the place. I analyzed all the possible contents and I decided to give up with using just one media for increasing the attention of the user and his curiosity in receiving different media. I decided to support the app with a paper map in order to help the user in the orientation along the path. The paper map has on the front a global view of all the path and on the back some information for using the map and the app and a specific view of each site, so the user can orientate not only globally, but also specificly in each part of the visit. 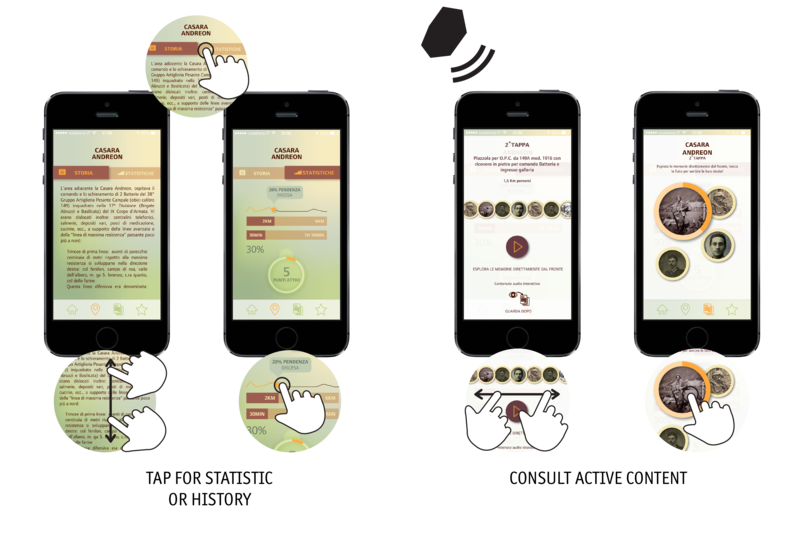 The color for the app and the map are taken from the place for a best integration with the nature and the sourrounding landscape.